IOSTATS – assuming that basic plan statistics are collected when SQL statements are executed (either by using the gather_plan_statistics hint or by setting the parameter statistics_level to ALL), this format shows IO statistics for ALL (or only for the LAST as shown below) executions of the cursor. 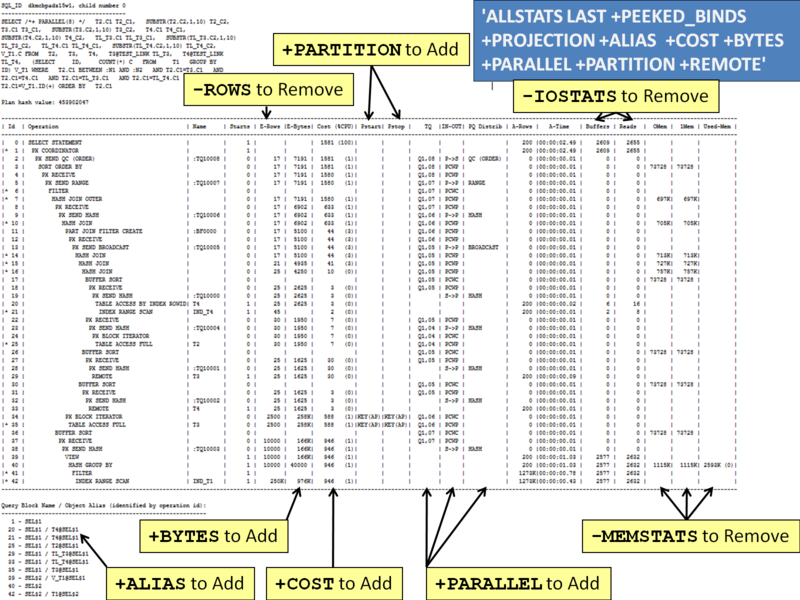 MEMSTATS – Assuming that PGA memory management is enabled (that is, pga_aggregate_target parameter is set to a non 0 value), this format allows to display memory management statistics (for example, execution mode of the operator, how much memory was used, number of bytes spilled to disk, and so on). These statistics only apply to memory intensive operations like hash-joins, sort or some bitmap operators. LAST – By default, plan statistics are shown for all executions of the cursor. The keyword LAST can be specified to see only the statistics for the last execution. RUNSTATS_TOT – Same as IOSTATS, that is, displays IO statistics for all executions of the specified cursor. The execution plan for the first child cursor shows on line ID 25 that 0 rows were retrieved from table T2, yet the execution plan shows that 200 rows were retrieved. SHOW PARAMETER OPTIMIZER_DYNAMIC_SAMPLING shows that dynamic sampling is set to 2, yet the Note section of the execution plans show that dynamic sampling at level 5 was performed (statistics were not collected for table T2). The Note section of the first child cursor shows that the degree of parallelism is 8 because of a hint, while the Note section of the second child cursor shows that the degree of parallelism was automatically computed as 8. What was the purpose of the second child cursor? No rows were returned, yet some lines in that plan show that 25 rows were retrieved. The following execution plan was created by specifying the format parameters displayed in the blue box. 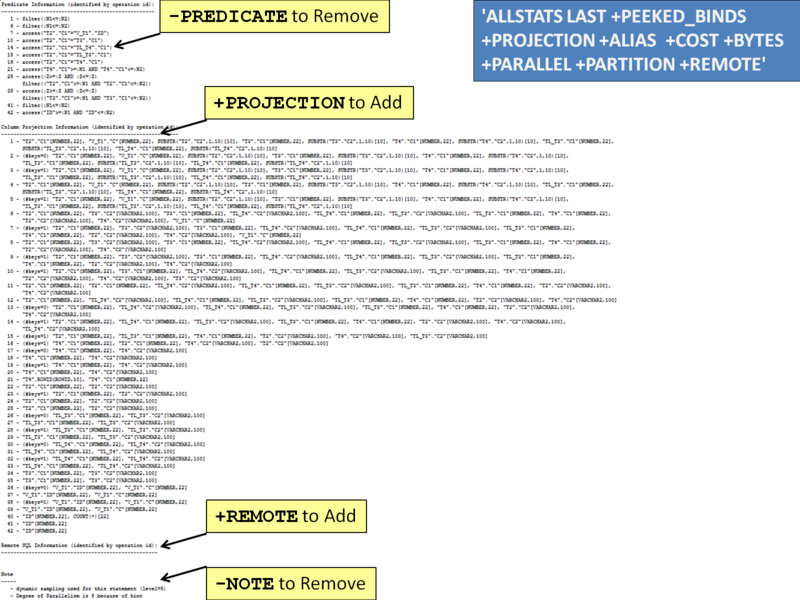 The yellow boxes indicate where those items appear in the execution plan, and how to remove other items that appear by default when the ALLSTATS LAST format parameter is provided. Execution Plans – What is the Plan, and Where Do I Find It?